I can’t imagine my life — and my writing life — if I hadn’t read those books and many others that have been banned or suggested for banning through the years. These books, like all books, taught me about people I didn’t know, cultures I’ve not seen, experiences I’ve not had, and life I’ve not lived. They showed me history and struggle and triumph. They revealed truths and reality in many cases. They ultimately showed me humanity. There’s nothing scary or threatening about that. Even if book banning isn’t as rampant today as it has been in the past, events like Banned Books Week remind us that it has happened and it could happen again. 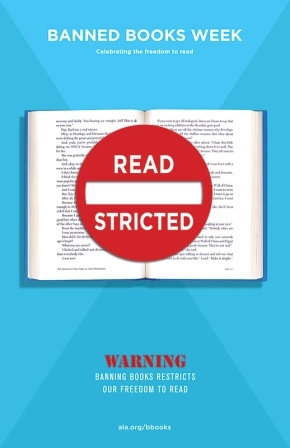 Read a banned book this week! Read — and think — for yourself. As organizers say, celebrate the freedom to read. Thanks, Robin. I know, right? Leaves of Grass is such a beautiful work, but people challenged it because its sexuality was “shocking” and there are homosexual overtones in places. Many people are afraid of what they don’t know. It’s a shame. Thanks for the comment and the compliment. Happy to have you here! You and I had the same thought this week. We have come far in the USA, but we still need to do more! I think Walt Whitman is such a great example of a banned book because…. WHY? How could anyone hate his work? And the answer is fear. Fear of something they didn’t understand. It’s an amazing clue into the sad mental processes of many banning groups both then and now. Great post my friend, thinking is always the key to making the world a better place.